The very idea of handsets, targeted at one certain group of consumers has been around for some time, however was completely ignored by all major manufacturers. It seemed that for this kind of handset, one would not exert too much of resources and time. Yet the markets uniting kids and older people were always passed by. Thus it was all up to smaller manufacturers to invent a corresponding device and ear themselves reputation on this. 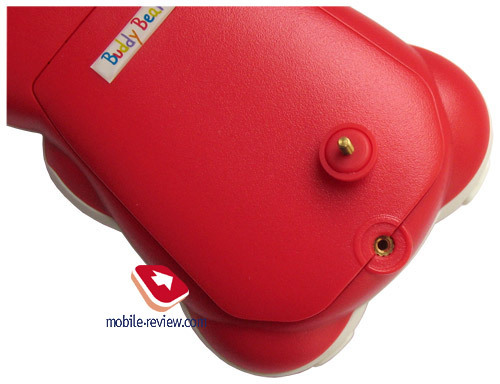 The market for the youngest “consumers” holds only three models, namely FireFly, iKids, and Buddy Bear, which is put into limelight this review. If you peek in the developer’s documents, you will find out that this phone is intended for kids from 3 years and older and is targeted to achieve several goals at once. Despite majority of handsets, this very device lacks display, indeed it’s absent. There is some logic in this, as you can hardly expect a preschool to read all inscriptions on a screen, even though there are some kids that are taught the alphabet when they are 3-4 years old, but they are few in numbers. On the other hand the screen should have been made able to reflect at least icons, which are intuitively obvious to any kid and basically they would have eased operation with the device given some sort of feedback between the infant and the cell phone. But first things first, let’s not put the card before the horse. The core sign allowing you to distinguish a kid aligned handset is its outlook; naturally you will recognize a toy in it at the first glance. For comparison, we decided to place Buddy Bear and a toy face-to-face on the picture – as you see, differences are eluding. 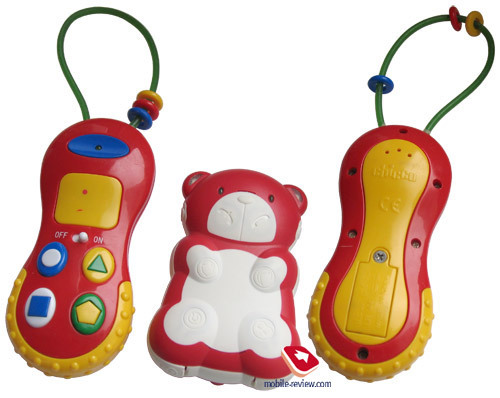 The toy has the appearance of a bear with buttons on his paws, while the animal’s face provides pick/hang up keys. The bear’s ears feature light indicators with several backlighting colors available. Trims of the handset are extremely diverse, so that you can choose the one appealing to you child’s taste or matching his cloths. In our case the phone was red. All framings of white color are made of soft plastic and feel somewhat similar to rubber; they are softer than the rest of the casing. 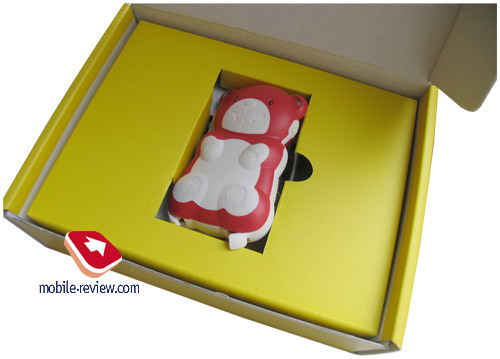 In fact the handset is a bit too large for a child’s hand; still a kid may hold it with two hands – basically the necessity in this is cause by the fact the button are too tight, so you will need to put some efforts into actually pressing one. 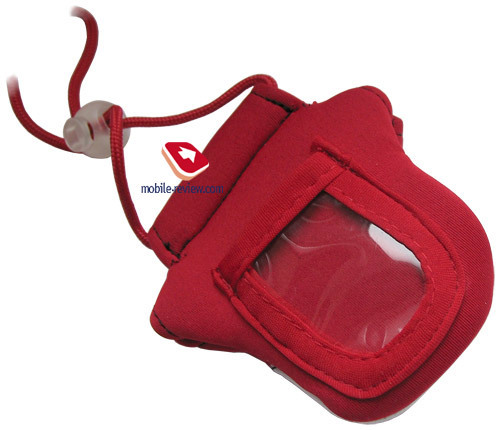 Although that excludes any accident pressings while the handset is carried in a pocket are a bag – there is no key lock function. The phone weights 82 grams, what is acceptable for kids of any age. 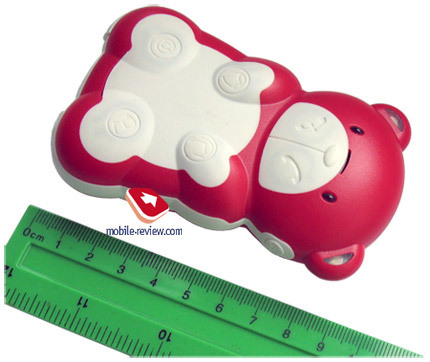 The manufacturer particularizes the fact that the used plastic is completely safe and kids may even bite it without any serious consequences. This is the sharpest distinction from all serial models, which commonly have unsafe materials for children, or anyone who would dare chew them, applied. 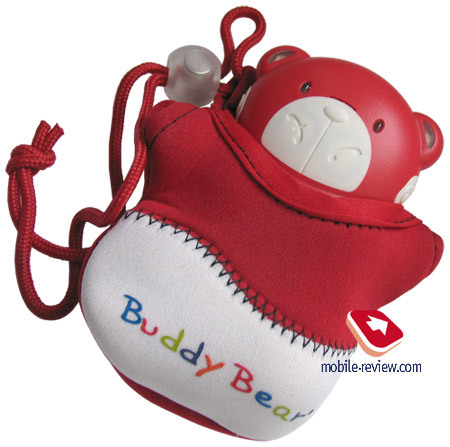 The topic of safety is implied almost in every single chapter of the User’s Guide, shipped with Buddy Bear. All adjustments are to be made via SMS messages, sent from other devices, that’s they way to perform this: you plug a SIM card in the Bear and begin sending messages to it from your own handset. All messages should start with a special four-digit code, a variety of PIN code, which is stored not on the SIM card, but in the phone’s memory instead. Should you type this password incorrectly, the cell phone will ignore the message. 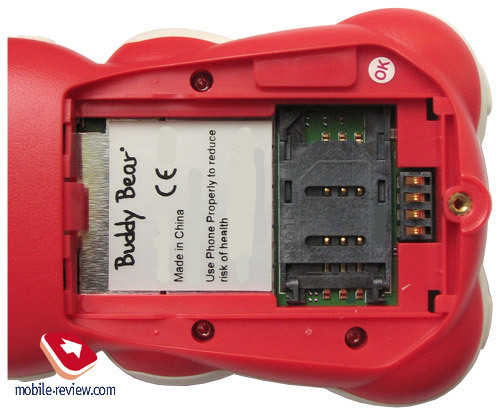 Attention, if you don’t switch PIN-code check off on the SIM card you are going to use with Buddy Bear, it will be impossible to operate with it. The User’s Guide includes description of all possible commands, which can be sent to the phone, so we are not going to double-post them here, and rather mention some of the highest interest. The SOS keys, allocated on the sides, may be assigned to forwarding various text messages to pre-set parent’s number. On the face of it, the function appears to be quite fresh, though I suppose it will not find wide application in practice, since a general message will be written by you, so it will be very hard to guess what it means in every given case. Moreover, normal parents are more likely to go crazy with anxiety. Another interesting feature is possibility of making a phone call you after receiving an SMS from your number, so you can hear what’s happening around your child. If the child doesn’t have the handset on him (though it is marked as “not recommended” in the user’s guide, there is a slot for a strap), you will not learn anything new. And what is more, presence of a cover on the handsets brings chances to hear something to zero. 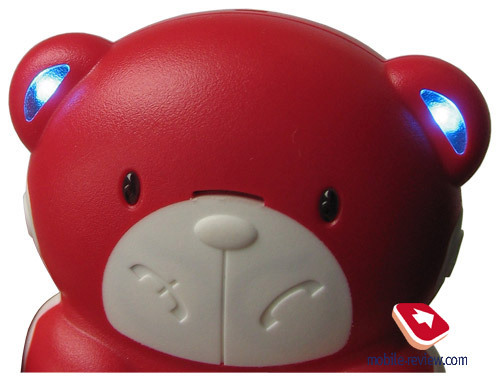 A hilarious fact - secrecy of listening is blown by the light indicators, which begin shimmering with various colors, so the child will instantly figure out that he is being bugged. As to the most demanded functions, the handset provides possibility of dialing pre-set phone numbers; having pressed a single key, a kid may either call you or someone out of relatives to tell about his problems etc. The indication system does not provide much information, so you will have to memorize which mode means what, I’m not even talking about children. Among nuisances we should point out the fact that network signal is marked with blue color, so later on you will spend an hour or two explaining to your kid why network indication uses green color instead of blue, for sure. 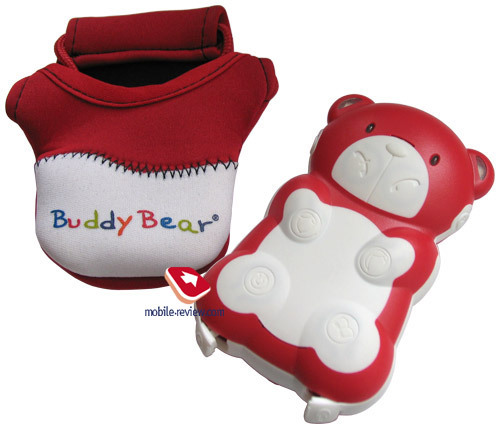 The handset has 16 mono tunes incorporated and also a vibration alarm – these can be set up with the help of Buddy Bear’s buttons, as well as tunes volume level, which is not very high. And it’s pretty clear – it was made in order not to harm a kid in any way. 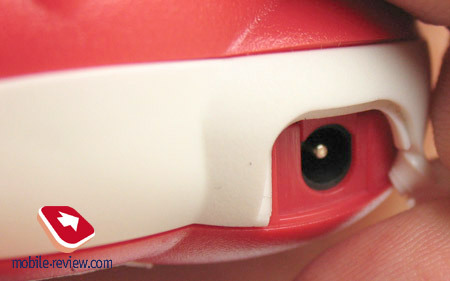 There is also a special jack for handsfree set on the bottom, accompanied by a slot for plugging in the charger. Yet children under seven cannot use this kind of accessory, what is implied by all standards. That’s why this port should be considered as a useless addition and nothing more. 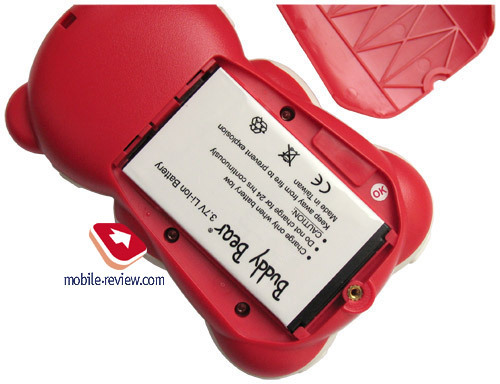 Quality of assembling is high with no visible flaws – the device lacks any infirmly mounted parts; the back cover, hiding the battery is fixed with a screw. 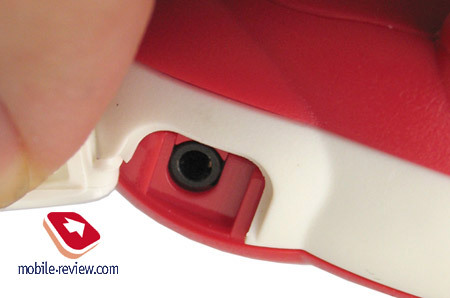 It can be turned off with the help of a screwdriver or any other sharp item. The manufacturer announces almost 100 hours of life time in standby mode and up to 3 hours of talk time. Under conditions of Moscow networks, the handset managed to last for 4 days with 1-2 calls of one minute duration per day. Now let’s talk about less pleasing facts. 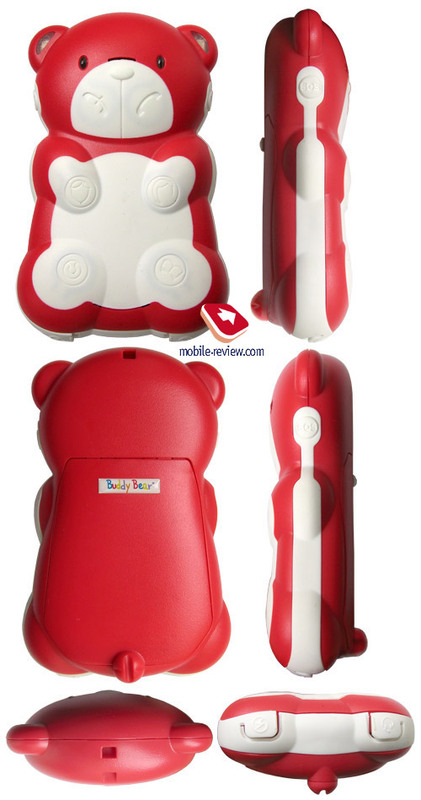 Basically, there is no limitation on age, though judging by the modern youth, which attends only the first year’s classes of elementary school, yet carries low-end or even medium-end models with them, a phone like Buddy Bear is likely to be in moderate demand, as children will see only a funny toy for kindergarten in it. So that’s how we acquired the age limit of 6 years. Now as regards the minimum age, this is 3 years, according to the manufacturer. A stumper for young parents – how often does your three-years old kids go out alone or stay home without you for long periods of time? And when he is in kindergarten mentors will most certainly ask him to put it in a locker. Over the past ten days, that I was thinking about possible situations where a kid may badly require a cell phone, I could not come up with an example. So let us sum up the aforesaid – on the whole it’s a very specific device which is not going to be in great demand, as it costs around 200 USD in Russia – as a matter of fact that is too much, so consequentially the potential audience will get even smaller. As long as these phones are running the same concepts are common handsets, they will remain high profile solutions. In order to make them widely popular, manufacturers need to re- conceive the very idea of building up a cell phone. We would like to thank www.webpanel.ru for supplying the device for this review.